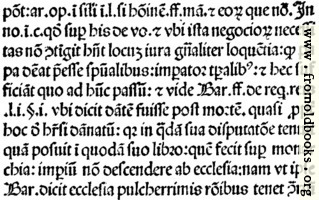 Years ago I bought a single page from a book printed from Nicholas Jenson (1420-1480) (also written Nicolas Jenson). Having moved house twice since I bought the page, I cannot now find the details, but I did find that the watemark indicates likely dates of 1476 or 1501; I remember that it was printed by Jenson in Venice, so the earlier date is much more likely. Nicholas Jenson is famous among typographers and printers for his Roman type design, but that was not used here. None the less, the page proportions and the actual font used are worthy of study, as are the Latin scribal abbreviations. Today I would be less likely to buy a single page, but at that time I didn’t realise someone had probably cut up the book to sell the individual sheets. 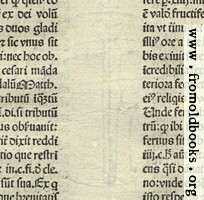 Detail from verso, showing the letter-forms.